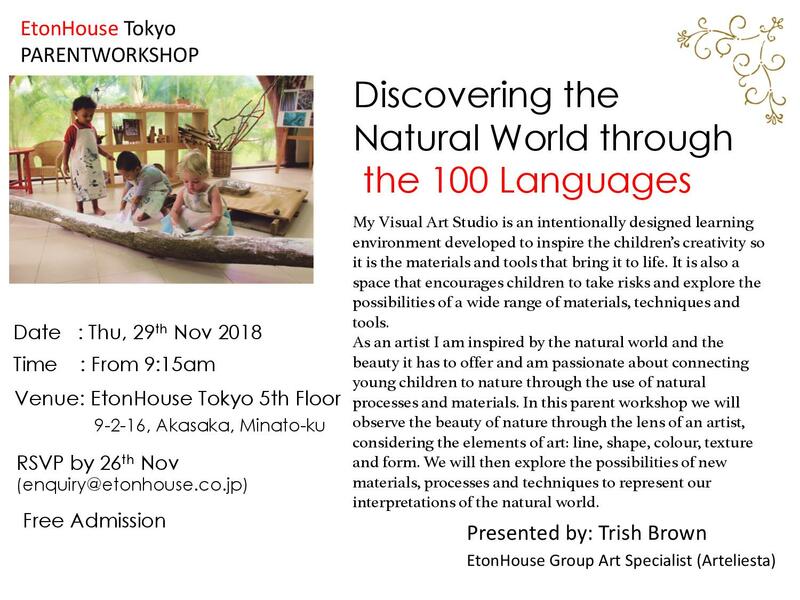 We’d like to share some feedback from the parents at EtonHouse Tokyo. A wonderful reinforcement indeed, of the work put in by the teachers. Our daughters had the pleasure of attending Eton House International Preschool in Tokyo for almost 2 years. From the very first day both our children were provided with a very engaging, supportive & hand’s on learning environment. I’d have to say the pre-school is a warm, welcoming & safe environment with lots of diversity. The teachers & support staff are truly fantastic. They always have the children’s best interests at heart and provide a great balance between nurturing & learning. We found our children to become much more independent and improve in their written & communication skills. Their multiple language skills (Japanese, Mandarin & English), as well as their confidence in expressing their thoughts and ideas were greatly developed while at Eton House. We also travelled quite frequently in and out of Japan throughout the 2 years and Eton house remained very supportive and accommodating during this time. We highly recommend EtonHouse as an outstanding international pre-school! We have been most impressed with our EtonHouse experience. Our daughter is engaged in meaningful, stimulating activities throughout her day that develop both her academic and social skill sets. Her teachers are a marvelous mix of child psychologist and educator–they operate with an unconditional positive regard for the children and ask thought-provoking questions that allow the children to explore and draw their own conclusions. Their use of the emergent curriculum model is outstanding and so exciting that we as parents are drawn to continue the themes at home. The teachers quickly tuned into our daughter’s strengths and areas for development and set thoughtful goals for her. She feels safe and attended to in class. She comes home speaking in Mandarin and is excited to teach us what she has learned. She loves school–What an excellent way to begin an education! 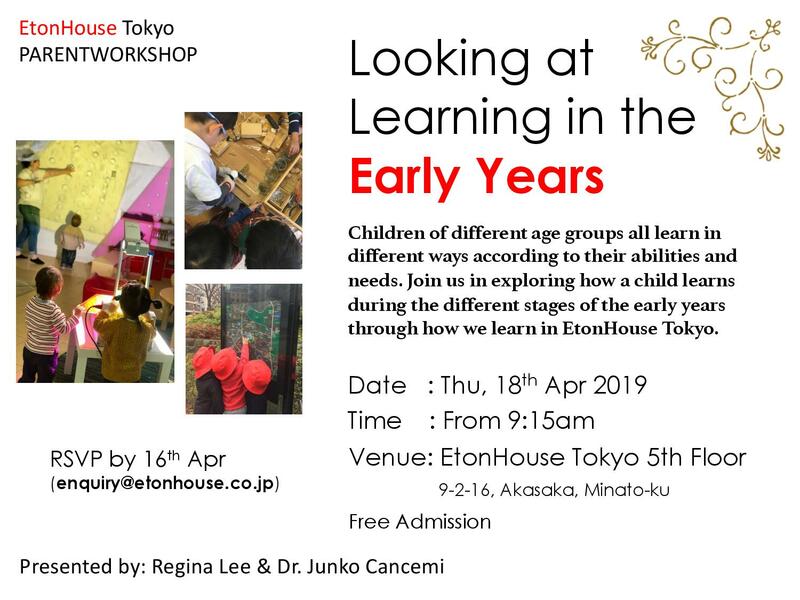 My son has attended EtonHouse Tokyo since he was 2 years old. There are many international schools in Tokyo. But I can assure you EtonHouse is a cut above the rest. The point is that EtonHouse has a bilingual education. We are Japanese native. We use only Japanese at home. That means he could not understand any English and Mandarin when he joined the school. The school tried to let him stay comfortable at school at first and tried to expose him to English and Mandarin. They also arranged him English and Mandarin after school classes as much as they could. Every teacher and all the staff talk and communicate with him a lot every day, read many books and ask him many questions, give him an opportunity to present to friends. Now he’s 5 years old, thanks to that, he can make himself understood in three languages. I think this drove him to various interests. For instance, he loves watching world news. And he’s interested in weather, science, nature, geography and current political matters. It’s a synergistic effect. I believe that bilingual (or trilingual) education will create a multiple effect for my son’s life in the future. Experienced-based study, the child-focused curriculum at EtonHouse also nurtured his gifts. And he learned how to solve problems, how to discuss with friends and how to achieve his goals. In addition, he also had great opportunities to meet, be a friend to people from different countries, experience different cultures. Teachers in this school are from many countries, full of knowledge and rich experiences in of early-childhood education. I believe my choice was right having chosen EtonHouse for my son, and his experiences there will surely bring about positive impact to his future. I am very satisfied with EtonHouse Tokyo and everything about it. In summary EtonHouse is an amazing School that children can benefit from. My son has completely settled and developed a strong foundation at EtonHouse Tokyo and that will allow him to continuously improve in life. Thank you, EtonHouse Tokyo!! Our son has been attending EtonHouse’s Japanese Early Learning Centre since June 2013. From the moment he walked in, he felt right at home. Indeed, the very day we went in to tour the facilities, our little one, seeing that the other kids were congregated around a low table eating their morning snacks in the bright, large nursery room, walked straight up to them, seated himself down, looked towards me with a smile on his face and asked: “Where is MY snack mummy?” Needless to say, I was sold! If the facilities had passed our Litmus test, we were nonetheless keen to find out more about the Reggio Emilia philosophy the school has based its curriculum on. Our children’s education being of paramount importance to us (we believe, for instance, in instilling sound eating habits and developing lifelong interest in health and learning), we knew we wanted to find an institution whose philosophy and culture resonated with our own personal values. EtonHouse International School proved to be just what we were looking for: a warm and stimulating environment where each child’s interest is carefully considered and drawn upon, and where an emphasis is placed on health and nutrition. We also found that the educators are quite competent and nurturing, and that they ensure all developmental aspects of a child – be it social, emotional, physical or cognitive – are all finely tuned under their guidance. Unlike many schools where schedules are rigid and allow very little leeway, EtonHouse lets you make changes to your child’s monthly attendance pattern, and is always willing to accommodate whenever possible. As an example, we enrolled our son in a weekly after school Mandarin class only to realise, a few weeks later, that it wasn’t the best fit, and so upon consulting with the director, we were able to switch him to a music class, which suited him better. Since our son’s first day at EtonHouse, we have regularly witnessed the positive effects of the school’s state-of-the-art pedagogy and teaching practices. We believe the staff’s unparalleled dedication and its concerted efforts in making the world a better place by shaping our kids’ futures and opening their minds onto a realm of possibilities are the school’s best assets. We really do wish there were more schools like EtonHouse!